Thinking about resolutions for the New Year? Maybe you’d like to pay off that pesky credit card debt or find a way to reduce the number of fees you are paying on your bank accounts. No matter your situation, you can certainly benefit from a financial New Year’s resolution. Home equity loan or line of credit – Take advantage of your home’s equity to consolidate your loans. If you are a homeowner, obtaining a home equity loan or line of credit may be your best option to pay down your debt with one bill, and most likely, a much lower interest rate. Personal loan – Personal loans (including lines of credit and installment loans) have lower interest rates than most credit cards and offer a viable solution for credit card debt consolidation. Credit card transfer – If you have several credit cards with balances, consider how a balance transfer to a credit card with a lower rate can save you money. Mid Penn Bank’s Visa® and American Express® credit cards offer reward programs, low introductory rates and other perks to help make loan consolidation easier. Improve your cash flow and open a checking account that’s totally free. If you’re paying monthly maintenance fees or low balance penalties, you can get a better deal elsewhere. 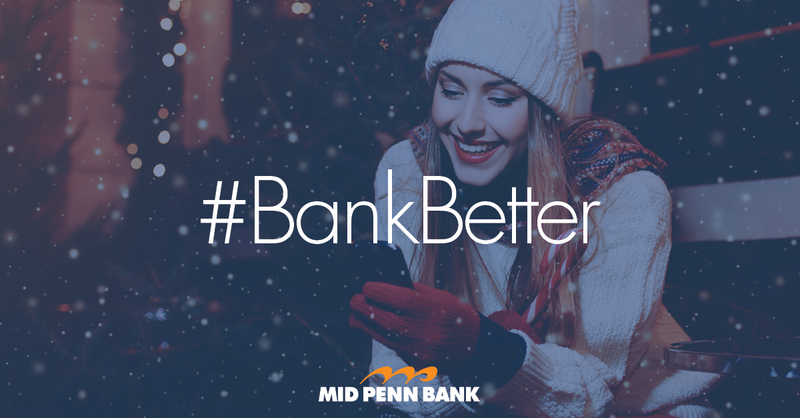 Mid Penn Bank’s Simply Free Checking account does not have a minimum balance requirement and offers free online banking, mobile banking and bill pay. Eliminate bank fees and you’ll be well on your way to saving money and improving your finances. Improving your credit score isn’t an overnight process, but if you start building better habits now, it will improve with time. Having a better credit score may help you obtain loans more easily, along with better rates. Make payments on time. Your payment history contributes the most to your credit score. Late payments generally stay on your credit report for seven years. Be cautious with how much credit you are using. It’s not just enough to pay off your credit card balance each month; you also need to watch your credit utilization ratio (your credit card balance versus your available credit). The optimal amount of credit to use each month is 30 percent or less. Don’t erase old debt. Any loans or credit cards that you’ve paid on time and managed well throughout their duration are good for your credit. Having a longer history of good debt is better for your overall credit score. Are there any other financial resolutions you would like to set for the New Year? Give us a call or stop by one of our branches today. Our team would be glad to help you!